General Finishes Waterbased Special Effects Glazes are used to highlight features and add dramatic effects to furniture and cabinetry. Glaze Effects are translucent water based colors that can be selectively applied and wiped off, leaving deeper or contrasting color behind to enhance and highlight project features or to add an aged effect. Use over Water Based Wood Stains and Milk Paints. 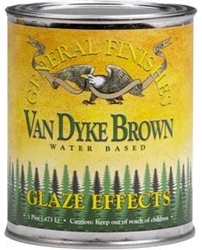 Glaze Effects can be inter-mixed to create custom colors. They may also be layered over one another to create deeper, richer looks. General Finishes Extender can be used to increase open time and workability.